I wanted to reach out to you regarding your blog post, “12 Reasons Why Peanut Free Schools Are Not Okay.”. Brava! Seriously, Nicolette, I want to thank you for sharing your different perspectives on peanut allergies and attempting to “walk full circle” around this sensitive issue. As the parent of children both with a severe peanut allergy and without, and as the sister of a sibling who had needs of his own, I applaud your desire to point out how the typical kiddos’ needs sometimes get lost in the shuffle. They surely do. And, wow, do I ever know it! Are you still reading? I hope so. Because now, I’m going to offer you just a couple of different perspectives. This is not a bashing. I promise. You’ve had enough of that. Regarding point #7, you had me at utilizing alternative methods for educating your child because, as any parent of a child who is immunocompromised will tell you, yes! That is necessary. Their childrens’ bodies cannot handle the influx of germs that are constantly circulating within a school building. They must seek alternative education sources and venues for this very reason. Is it hard? Oh yes it is. Is it their life? Yes indeedy. But, you lost me at meeting a “basic set bar of expectations”. I’m wondering if you envision a society where the folks who can’t meet a basic set bar of expectations are required to live, work, and play in areas that don’t infringe in any way on those who can. Will my child, with autism, who is most times able to meet that bar, but not always, be allowed to interact with those who’ve met the bar? Or, should he be educated at home. And, once he becomes an adult, maybe he should just work from his home, or mine (whichever – we’re cool with however that plays out) so that his needs don’t infringe on the needs of those working diligently, you know, at the bar. Because, of course, our children are equal. If my son becomes a brilliant scientist (from my lips to God’s ears!) who is able to research a cure for cancer because of his experiences and perspectives, but can’t be near peanuts while he’s researching, he will take the necessary precautions. Because, here’s another place we agree, it’s ultimately going to be his responsibility to take the precautions necessary to guard his life. Here’s the thing, though – any adult he is working with is probably going to take precautions as well. Because, respect for differences manifests itself through kindness and consideration. We don’t take breaks for those kinds of character traits. Another perspective I’d ask you to consider is when my son, who is peanut allergic, attends school with sweet Sally. I’m talking about this precious child, that you mentioned, who just lost her sweet mother to cancer. And, Sally does indeed need to eat peanut butter each day to help her soothe her grief over her mama’s recent death. So, because I care about all children, I encourage my child to leave the table where all of the other children are sitting and go sit at the peanut free table. And, he does. He’s told by their teacher, of course, that he can ask a friend to sit with him. But, at the tender age of 9,10,11… no one wants to sit with him because, well … I’m sure you are totally aware of the social interaction dynamics of pre-adolescents. So he sits there. Alone. And, that’s okay. That’s his cross to bear. Not sweet Sally’s. But then, there are a group of Sally’s, or Sals, who have parents who have voiced their own perspective about why “these kids” even need to be at school with their typical children. They get agitated that they can’t bring in candy for holidays and cupcakes for birthdays. It is so frustrating that they vent about it. At home, of course. But, Sal and Sally hear all of this venting and begin to live out what they hear at home, as children sometimes do. And one day, they jokingly smear peanut butter across the back of my son’s shirt as he is eating, at the peanut-free table, because they think it’s funny. And, well, he shouldn’t even be at school anyway. “My child would never!”, you are thinking. Right? I mean, I would too! But, the reality is that lots of our children do. Unless we stress the importance of not taking a break from kindness and consideration. Not because we want to maximize the importance of some over all. But because that’s what respecting differences is all about. I move over to make room for you because it’s the right thing to do. I guess what I’m trying to say is, I respect you. You are a human with different perspectives than me. And I hope that you never stop writing what you think – because then we shut down dialogue, altogether. I don’t want our society to become an us versus them society. And, I’m pretty confident that you don’t either. So, I’ll wrap up my letter to you by asking you to never stop walking full circle around these issues. And, please, never stop listening when others point out that you didn’t quite close that circle up. Something really exciting is happening on Wednesday over at (in)courage. Me and about 30,000 of my closest friends begin the Made To Crave Online Bible Study over at P31 Ministries this week. I’ve got to get my unsuspecting children over to the Allergist for their annual “pricky hurty test“. Joy. Abounding. Both of the Sweetchildren’s extra-curricular activities resume this week. I’m still clearing out the clutter. Aside from all of that, I’ve got the joy, joy, joy, joy, down in my heart! My rash is disappearing! It is GOING AWAY! I could do the Texas Two-Step (if I knew how)! I may even be able to throw on a 3/4 sleeved shirt to celebrate the balmy 50 degree spring day we’re having here today. Tell me about your week. Please do. Let’s share all of our Crazy together, kay? What started as a strange little rash on the backs of my legs two weeks before Christmas has spread like wildfire all over my body. Not. Even. Kidding. And I would have lived with it…happily. And stayed covered head to toe in clothes that would not only guard against these single digit temperatures we’ve been experiencing up here in the Northeast, but also hidden the effects of some of the leftover Christmas cookies I may or may not have consumed recently. But, once I discovered they were making their way upwards and started to see them in my hairline, I put my foot down. You do NOT mess with a girl’s hair! Now, when my general practitioner initially took a look at this little rash those four weeks ago, she had no idea what it could be. “Maybe an allergic reaction to the amoxicillin? Why don’t you stop using it and let’s see what happens over the next 2 weeks.”, was her suggestion. So, back to the doctor I went. But this time, I was rerouted to my dermatologist. Now, I love my dermatologist. He reminds me of Mr. Magoo and he always has a mischievous twinkle in his eye. Plus, he’s seen me naked and never batted an eye. Anyhoo, he saw me and instantly lit up with a huge smile and shook my hands warmly as he asked me to what he owed the pleasure of seeing me again so soon. I threw off that glamorous johnny quicker than a woman on fire and pointed to my head. “Look at this! This rash is creeping up into my hairline! You’ve got to help me get rid of this rash, Dr. G.!” Now, I think the nurse might have snickered a bit at the fact that I didn’t mind standing practically buck-nekid while I feverishly pointed to my hair, but I didn’t give two hoots. “Hmmm…”, he said all calm-like. He then asked me exactly 2 questions before solving this mystery. “Guess what you have?”, he asked as if he was dying for me to know the answer and just couldn’t wait to tell me. “A rash?”, I gamely replied. “Better! A STREP RASH!”, he excitedly said. I am apparently “one in a million” people who get an All Over Body Rash from Strep throat. Yes indeedy. It turns out that I’m allergic to Strep Throat. “Look! Look right here!”, he pointed to HIS manual of Every Horrendous Rash Ever (what IS IT about me that makes doctors think I’m up for seeing that business???). My poor Sweetman doesn’t know whether it will make me happier to love on me or to not touch me all. My Sweetboy is “too worried that I’ll catch it, mama!”, to let me love on him. But, as usual, God got the last laugh in this situation because Sweetgirl? The one who I could use just an ever-so-teensy break from? She’s all over me. It is never appropriate to sniff your neighbor. Let’s take that as a public service announcement. I used to love a perfume with a hideous bottle. Let’s just say it rhymed with Ron Saul Faulty-ay. When Sweetman and I were dating, Ron Saul and I had to break up. It was a tragic. I loved how Ron made me smell. Unfortunately, however, Sweetman couldn’t bear this other man being in my life! Or on me. Literally. His body couldn’t bear it. He would get a monster migraine, along with all the nausea one could never want, for each and every date that I arrived at with all my perfumed self. We came to realize that it was, indeed, my perfume that made him so ill. Actually, “we” didn’t come to realize a dern thing. It’s just that Sweetman finally got comfortable enough, and he liked me enough to stick it out until he could get comfortable enough, to tell me that my perfume made him sick. That’s Real Romance, right there, folks. I have not worn perfume in 16 years, 1 month, and 5 days. Or something like that. Not that I’m counting. It should come as no surprise, then, that when my neighbor stopped by the other day, smelling beautifully reminiscent of my old flame, Ron Saul, we had an awkward encounter. It started off just fine and dandy. Oh, perfume, I miss you so… My neighbor wishes I didn’t miss you quite so much. I could have named it, One Out of Three Ain’t Bad. Or, more to the point, how To Survive Allergy Testing with a 4 Year Old. In the interest of helping others, I shall share. You’re welcome, in advance. We recently went in for our yearly allergy testing appointment. This wasn’t Sweetboy’s first rodeo. He knew the drill. Sweetgirl, however, did not. Oh, no, she most certainly did not! And when she got a load of how it was going to go down, I learned quickly that there were only 3 things that helped me survive those moments between arrival and departure. And for the record? I only brought one of them with me. First, though, for those of you who don’t have to deal with allergies, here is a quick and painless tutorial on why we even do allergy testing. 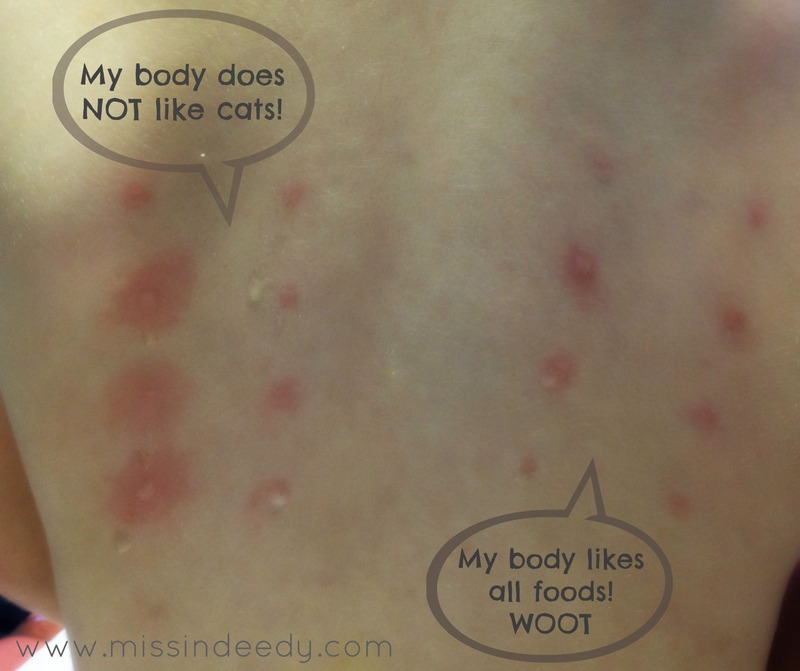 You discover that your child has broken out in hives, a part of their face is swelling, or they are itching the ever-lovin’-tar out of a part of their body right after eating/touching some unknown thing. You’ve heard that Benadryl is a miracle drug for allergies, so you give it. It helps. This makes you curious. To your dismay, you discover that your child has this reaction every. Single. Time. he or she eats this thing or comes into contact with it. You call friends who have had experience with allergies and ask, “What in the tarnation do I do now?”. They tell you to call a Pediatric Allergist, post-haste (quicker than spit). Let’s proceed to the actual allergy testing appointment, shall we? After enduring high-pitched screams that very likely rival a dying pig’s final moments (not that I’ve ever heard them, but I can imagine), you begin to see this on the back of your sweet child. The 8 spots on the right side of her back represent 8 foods (peanuts, soy, milk, wheat, etc.). The 8 spots on the left represent environmental things (cats, dogs, dust, mold, etc.). And there you have it. Not exactly rocket science. Mostly sheer luck. Yep, that’s how we roll around here. That, and a LOT of prayer. Yes indeedy!